There are many developments to note in the cultural engagement with illustration in the past few years, and especially in 2018. Washington University and the Modern Graphic History Library have played a part in many of them. I will be writing about several of these this month and next. But this week I am particularly happy to note that a major figure in American illustration will be honored in Florence, Italy, of all places. Howard Pyle (1853-1911) is associated with many things: tales of adventure on the high seas and the visualization of Caribbean piracy; the definitive modern version of Robin Hood; numerous works for children, including Salt and Pepper to the Wonder Clock; historical illustration of the American Revolution, esp. in collaboration with but also independent of Woodrow Wilson; the creation of what became known as the Brandywine School of American Illustration, in Chadds Ford, Pennsylvania. Possibly less well known is that Pyle traveled to Florence at the end of his life to gain inspiration to reboot his career as a muralist, when many illustrators were shifting gears to just that. Pyle was beset by illness almost from the beginning of his Italian sojourn, and he died in Florence in 1911. He is buried in the Protestant cemetery, and a placard noting his cremated remains may be tracked down at Piazza Donatello, Florence. But Pyle's residence in Florence had been lost to time, save for a period photograph; the street name and number had changed. With some doggedness, WU professor and former School of Art dean Jeffrey Pike located the building, now on Via Garibaldi, near the Arno. And with a great deal of doggedness, bordering on monomania (which is what it took) Pike managed with local help to convince the Florentines to install a plaque on the building marking Howard Pyle as part of the the artistic heritage of Florence--which is saying something extraordinary indeed. I am here for the dedication of the plaque and the attendant symposium, at which I will be honored to speak tomorrow. Bravo to Pike, and bravo to the Florentines, for recognizing a figure of significance in global visual culture. I will post a summary of my remarks in this space in coming days. Howard Pyle, The Buccaneer was a picturesque fellow, illustration for "The Fate of a Treasure Town," in Harper's Monthly Magazine, December 1905. Better known as Buccaneer of the Caribbean, republished and so captioned in the posthumous collection, Howard Pyle's Book of Pirates, 1923. Original painting in the Delaware Art Museum. 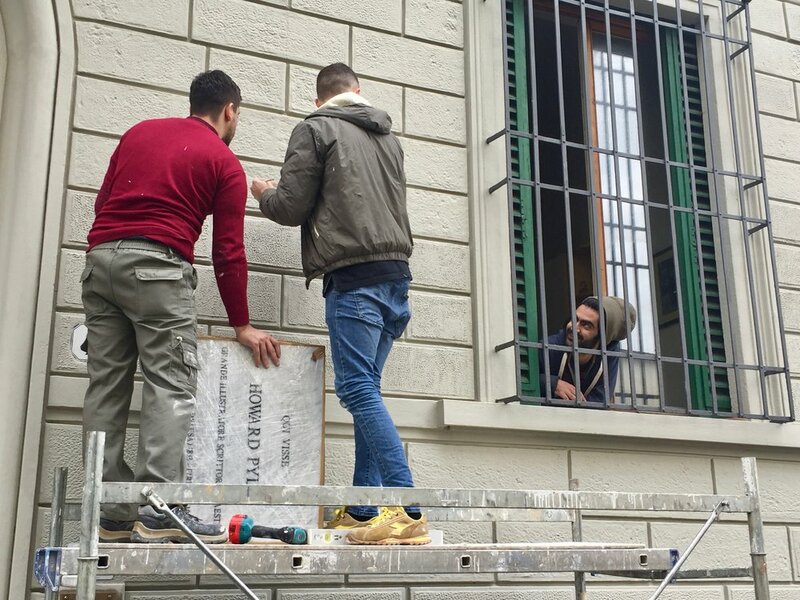 Howard Pyle Plaque Installation, photograph by Jeff Pike (with Rockwellian Flourish of guy in window), Florence, Italy, March 11, 2018. Howard Pyle, The Battle of Nashville, 1906. Minnesota Statehouse, Saint Paul, Minnesota.